Through its multi-directional bio-mechanical design, TRI-STRETCH® allows interaction of the joints and lengthening of the muscles in all three planes of movement..replicating the exact manner in which the muscles get stretched when you run, walk or exercise. In addition, TRI-STRETCH® allows for just the right amount of instability to allow for successful dynamic balance and strength training of the lower extremity and core. TRI-STRETCH® adds instability in two unique ways: 1-providing a greater challenge without risking injury from too much instability and 2-ability to challenge the lower extremity and core in the sagittal, frontal and transverse planes. TRI-STRETCH® is not only a piece of training equipment, TRI-STRETCH® comes with one of a kind content for sports specific functional training written by an orthopedic physical therapist with extensive knowledge and experience in functional training and rehabilitation. The Result: advanced training possibilities for all of your athlete’s needs from improving sports performance to rehabilitation of injuries. - Rearfoot Rocker to allow frontal plane rocking: unlocking the transverse plane. - Functional Sports Training Device with content to improve performance including golf and pitching programs. I am an orthopedic/sports physical therapist and strength and conditioning coach. I have developed and brought to market the above product. It has been successful at the highest levels; being used by professional and collegiate athletes across the world and across all sports. I am looking for a license deal with royalties but will consider an outright sale. My product is trademarked and the patent includes the model that is already on the market and a "commercial/facility" model that I have the prototype for but has not been put on the market. This is a product that is on the forefront of functional training and has proven itself to be a valid training tool . What it needs now, is a company that can "take it and run with it" so that it is mass marketed. The potential is unlimited. 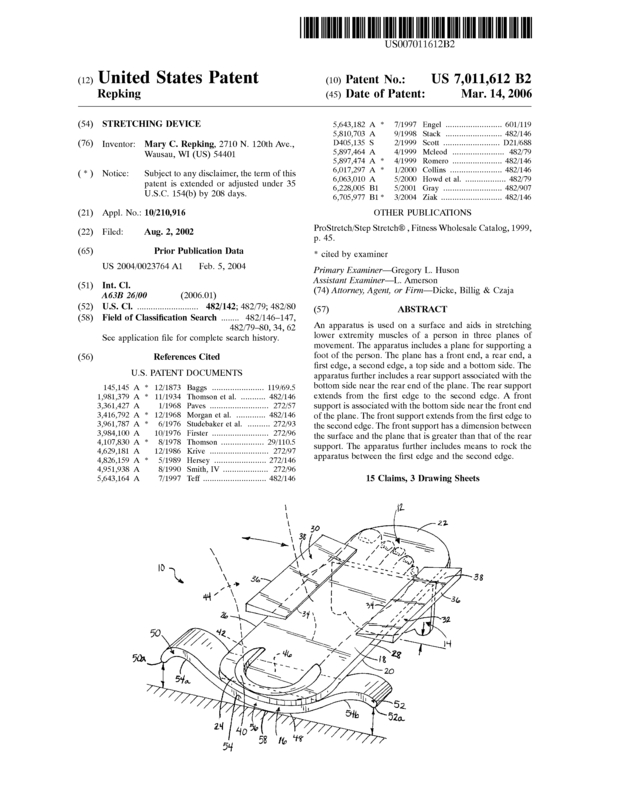 Page created at 2019-04-25 10:01:20, Patent Auction Time.